My first week in California has been a good one. I've been getting up to speed at work, and I've settled into my apartment a little more. My roommate arrived last night, so I'll have some company for the rest of the summer. My first week at Apple has gone well. The first couple of days were filled with the typical boring new job drill: new employee orientation, getting a badge, installing software on my computer, and setting up various accounts. After that, I started doing my actual work, and things got a lot more interesting. I'm developing software (firmware, really) for a next-generation iPod. I like my team, and I like the work I'm doing. About my only complaint is that my cube is pretty small, and I have to share it. Despite that, I think it's going to be a good internship. I discovered this week that a box lasts me about three days, so I have a little over a month's worth of breakfast stashed above the cabinet. Maybe I should buy stock in General Mills. That's awesome Bruce! I wish that I understood something about computers' under-workings, but I don't. I think that computers will be my hobby and I'll just be a business man that wants to invest capitol in Bruce Christensen, so let me know when you sell some personal stock and I'll be there. PEACE! Its important to play the cereal commodities market well. Like many commodities, the prices go up and down, and its important to buy in bulk when the price is down! First off: congratulations! So excited for you… just remember your days back at Orangatango, and be thankful the paychecks are regular. So which campus are you at? How long is the internship? Are you hoping to maybe get brought-on post-internship? Badger: props on the proper use of the apostrophe on "computers'". Bob would be proud. Jacob: True. 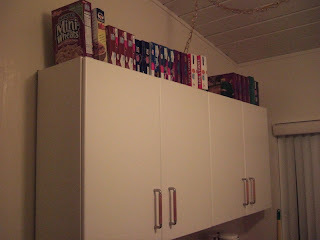 Hence my massive, but rather homogeneous collection of cereal. Guess what was on sale? Incidentally, I looked at my collection and realized that I have no General Mill boxes, so I should probably invest in Kellogg's instead. 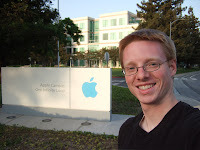 Silus: I'm at the main Cupertino campus, just across the street from Infinite Loop. I'll be here for about three months, and then I'll be traveling during most of August. I'm maybe hoping to get brought on for a while, but I'm planning on grad school, so it won't be anything long term, at least not the near future. So where are you leaning towards vis a vis grad school? Have you put a radio in the iPod yet? Smiths had its cereal sale this week so Evan and I bought 12 boxes. Now our pantry looks like your kitchen. Can you balance the federal budget?